BlackRock Inc. is threatening to vote against them and other directors seen as over-committed in upcoming elections as part of a recent update to its voting guidelines for the U.S. The guidelines previously said CEOs shouldn’t sit on more than two outside boards. Michelle Edkins, a managing director at BlackRock and global head of its investment stewardship team, said the update reflects what’s now “widely accepted as good practice” among the companies and boards it talks with throughout the year. In the past, it was more common for the nation’s top executives to sit on at least one other public company board outside their own, according to data from executive recruiter Spencer Stuart. Today, most CEOs at companies in the S&P 500 index don’t sit on any outside boards and those who do usually sit on just one. Only 22 CEOs in Spencer Stuart’s sample would exceed BlackRock’s new standard. “On top of that, it’s a reflection more generally that responsibilities on board members continue to increase and we want to make sure that for CEOs, being an outside board member never detracts from their CEO role,” Edkins told Bloomberg Law. A recent study by governance data provider Equilar found that shareholders at S&P 500 companies saw lower returns when the CEO sat on more than one other company’s board. A concern for overboarding was the top reason BlackRock voted against directors at companies in the Russell 3000 index in 2016, according to the most recent data available from researcher Proxy Insight. Directors who aren’t CEOs are considered overboarded in the investment manager’s eyes when they sit on more than four total public company boards, which Equilar research indicates few Russell 3000 directors do. Spencer Stuart says boards are self-policing the issue. 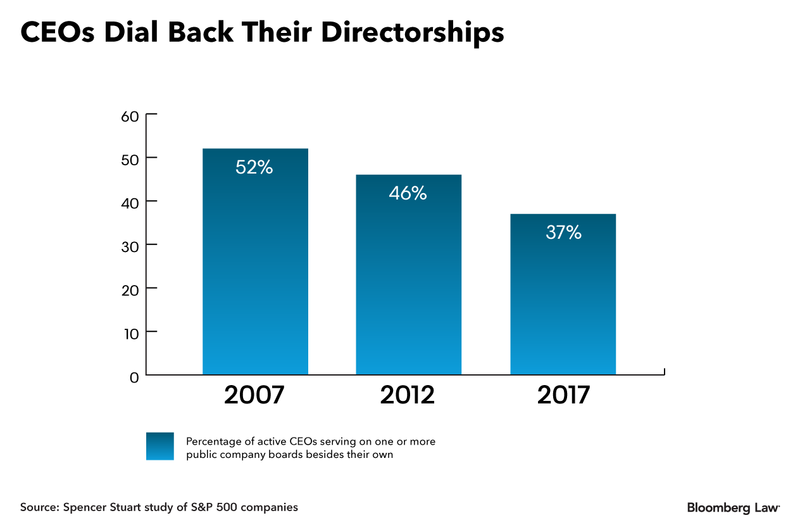 More than three-quarters of S&P 500 boards put a limit on their directors’ ability to accept other corporate directorships in 2017, up from about half in 2007, its data show. Policies are generally tougher for directors who are CEOs or otherwise fully employed, rather than retired. “Boards are taking this very seriously,” and not just to avoid a ‘no’ vote, Julie Daum, who leads Spencer Stuart’s North American board practice, told Bloomberg Law. She said it’s also because CEOs and directors recognize how time-intensive both jobs are. “People agree that the job of director is much more demanding than it used to be and the job of CEO is much more demanding than it used to be,” Doug Chia, executive director of the Conference Board’s governance center, told Bloomberg Law. The Conference Board is a membership and research association for businesses. So “it’s perfectly appropriate” to put a limit on the CEO’s extracurricular activities, Chia said. Vanguard Group, the world’s second-largest investment manager, doesn’t cover overboarding in its voting guidelines. The latest guidelines from third-largest asset manager State Street Corp., which haven’t been updated yet for this voting season, say directors should sit on no more than three total public company boards if they’re a CEO and no more than six if they’re not.